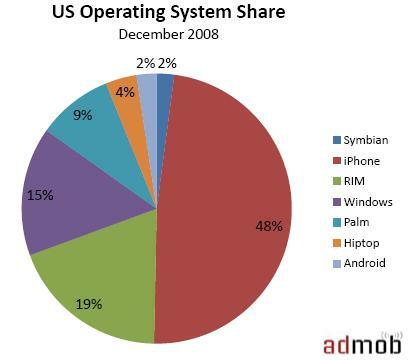 No surprise really, but the latest data from AdMob (the leading mobile advertising marketplace) shows that Apple is crushing the competition in the mobile Web space in the U.S. What is a surprise, however, is that the iPod touch is a big part of it. Mobile Web requests from the iPod touch grew from 18 million in July '08, to a whopping 292 million in December '08. Keep in mind that this data is exclusive to sites that run AdMob ads. It's also slanted to smart phones. (The chart below is exclusive to smart phones.) That said, it's still a good picture of how the mobile Web is being accessed, as far as it concerns you. Why? Because chances are, unless you run a very popular sports, news or weather website, mobile Web users are most likely to access your site through a smart phone, where pages can be displayed near their original form. Users are more likely to surf the Web on a phone and system that can handle it. It should also be noted that the iPhone and iPod touch got an early jump start, so as more phones become 3G capable, and more touch-screens are released, the numbers might change. For now it's still safe to say that Apple will represent a huge part of the market. AdMob also announced a new Download Tracking service, that will monitor App Store conversion rates for developers. A very nice tool to see from where on the Web your app downloads are originating.